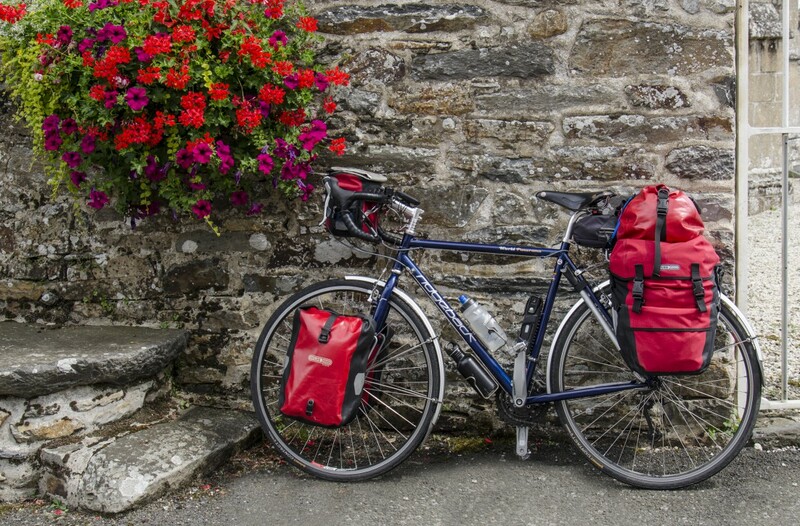 We spent a few weeks trying to decide where to go to test out the Bromptons for cycle touring. A seed had been sown when I was following Nick Crane’s tweets about his cycle trip with his son along the NCN 4 out of London, along the Kennet and Avon Canal to Bath and onwards to Devon. ‘Sounds like a good idea’, I said to Chris, ‘why don’t we give it a try but avoid the London bit?’ So a plan was hatched. Being of a certain age, we were able to apply for a Senior Railcard – I suppose there are one or two perks to being over 60 :o( – and purchasing them with our double-value Tesco rewards made them even more of a bargain. We booked a ticket from Poole to Reading and set about revising our packing routine for travelling with the Bromptons. We had bought a T bag for the front of each bike – these bags take approx. 31 litres and are equivalent to about 1.5 panniers – but were not quite sure what to do about rear bags. The Brompton rack sack has a capacity of 16 litres and is purpose built to fit the rear rack, but we weren’t sure if it was going to be big enough. As far as we could see, the only alternatives were to lay a pannier flat on the rack and attach it securely to the rack (see http://www.shanecycles.com/the-genius-of-brompton-touring/) or fix a rucksack in an upright position by attaching it to the saddle and securing it to the rear rack to prevent movement (see Pathlesspedaled http://youtu.be/4c76T3g5wwY). Our pannier seemed to have quite a bit of overhang off the back of the rack, which concerned us a little, and we weren’t too sure that a rucksack would remain securely fixed to the bike. In the end, we decided to go for the Brompton rack sack, as it would make us try to lighten our load, which is never a bad thing! The weight limit for luggage on a Brompton bike is 10 kg each on the front and rear. By the time we had added two bottles of water, we were both about at the limit on the front. On the back, I had a couple of kg to spare, while Chris had about 5 kg spare. We managed to get all of the essentials in, but it was a squeeze! Of the three items of luxury we allow ourselves – a Thermarest pillow (essential for a good night’s sleep, light but bulky), our Helinox lightweight chairs (the old bones start to creak when sitting on the ground) and a book to read (it is supposed to be a holiday, after all!) – we could only manage to fit in the pillows. Then a moment of inspiration! Usually not one for attaching things to the outside of bags, it occurred to me that the Helinox chairs could be easily bungeed to the rear rack on top of the rack sack. Brilliant! Chris had to forgo her book (I have a Kindle but she doesn’t yet – says she loves the feel of a book in her hands), but said, wryly, that she was looking forward to some scintillating conversation instead! I detected a hint of sarcasm here! The only other items that space would not permit were our sandals (and boy did we need them as we caught the start of the heatwave weather halfway through our trip!) and food provisions. Chris is only happy if she has a couple of days’ supply of food with her. I’m trying to break her of this habit by telling her that there’s always a little shop somewhere nearby and, failing that, a pub offering some sort of food (oh, and the obligatory pint or two of real ale!). We may look again at the packing options for the rear of the bikes but, for now, we were ready for the off! Categories: Bike, Bike packing, Camping, Cycle touring, cycling, Environment, good health, Mike McEnnerney, photographer, Photography, PhotoLink Images, thepedallingphotographer.com, Tourism, Travel | Tags: Bicycle touring, Brompton Bicycle, Cycle Camping, Cycle touring, cycle tourists, Cycling, Helinox Chair One, kennet and avon, kennet and avon canal, Photography, senior railcard, The pedalling photographer, Thermarest, transportation, Travel, Travel and Tourism | Permalink.